Challenger, America's Favorite Eagle, Eaglet's World, Thunder Birds Nature's Flying Predators, and Vulture View NOW for immediate download for only $16.95! What do you know about vultures? Why do vultures soar and glide through the air? How do vultures use the temperature of the air to help them fly? Why do we need vultures? What kinds of food do vultures eat? Could you eat what they eat? What would you like to know about vultures? In Vulture View by April Sayre you will see Steve Jenkins's beautiful illustrations and learn about these interesting birds. 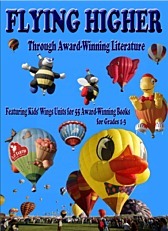 The author's simple, rhyming text invites you to learn and discover more. In her end notes, the author's section "Get to Know Vultures" gives you a place to learn the answers to your questions about vultures! It is an important science book to have in every primary library.